This ancestral home is one kilometre from the historical Castilian town of Tordesillas, an important crossroads since Roman times. An oasis of green in the surrounding landscape. 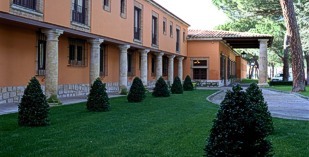 A beautiful pine grove and a spacious well cared for garden surround the Parador giving a sense of tranquillity and peace. The Castilian style of architecture dominates both the external lines as well as in the interior. Some of the rooms contain valuable antiques from the country mansions of the area. The peace which reigns throughout the building is an invitation to rest, go for a walk or swim in the spectacular blue swimming pool. El manjar de la Vega (fromage frais dessert). While in Tordesillas, visit the Royal Monastery of Santa Clara, a former palace built in the 14th century which is a beautiful example of Arab architecture brought to the area during the rule by the Moors. Also in the town, visit the Houses of the Treaty and the Churches of San Antolin, Santa Maria and San Pedro. Outside of Tordesillas, there is the Mota Castle in Medina del Campo, the "Historic-Artistic" groups of buildings at Uruena and Toro and the Mozarabe church of San Cebrian de Mazote. Wine lovers can follow the white wine routes of Rueda. In the nearby city of Valladolid visit the magnificent Museum of Sculpture, the College of San Gregorio, the Church of San Pablo and the Church of Santa Maria la Anmtigua. The year in Tordesillas starts with a masquerade party on the night of January the 5th. This is a contrast to the annual winter motorcycle rally which takes place on the second weekend in January. Easter culture is deeply rooted in Tordesillas and Valladolid with many processions. Later in the year, the festival of Toro de la Vega is celebrated in the month of September. During the first weekend of October a Medieval Market is held with a handicrafts market taking place on the following weekend. Enjoy the Natural Park of the Culebra Sierra (Mountains) and the riverside walks of the Duero river. Activities available in the area include swimming in the Parador pool, playing golf or flying in a micro light aircraft. The Nature Park of Castilla y Leon is only 12 miles away from Tordesillas and the Valvo Zoo is a natural paradise. The Parador of Tordesillas has thirty eight twin bedded rooms, twenty seven rooms with a double bed, two suites and one easy access room. All the rooms have a private bathroom and there is a telephone, satellite television, safe and a mini bar. The building has air conditioning and central heating. 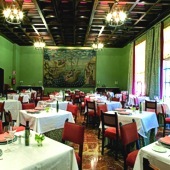 The Parador Tordesillas has currency exchange, lift, free internet access in communal areas, garage and parking (without security and limited places), satellite television, a gift shop, restaurant and bar. There are facilities at the hotel for business meetings. Other facilities include a garden with a children's playground, gymnasium, heated swimming pool and seasonal outdoor swimming pool, jacuzzi, sauna and Turkish bath. 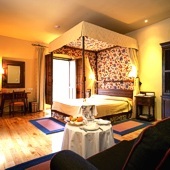 The parador has facilities for the disabled. Distance from the nearest airport is approximately 32 kms and the nearest train station is 31 kms away. We stayed twice at the Tordesillas parador early in August and at the end of August, on our way to and from Portugal and had a very enjoyable experience. The (standard) room itself, though nice and cosy, had nothing particular about it and was not very large, but it was very quiet and we spent a restful night, and the bathroom was pleasant and well-equipped. 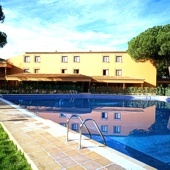 The highlights of the place are of course the outside swimming pool which is huge, beautiful, although quite chilly, and located in a marvellous setting of pine-trees, and the quality of the food (excellent buffet breakfast). Dinner was also very good, the dining-room is large and beautiful, and we found the service friendly and efficient even if some guests' comments seem to indicate that when the "comedor" is full, service is not so good... Our experience at the Parador was globally quite positive and Tordesillas deserves a visit, especially the convent of Santa Clara. We have stayed at the parador Tordesillas many times on our way between Santander and the Algarve. Always an excellent choice with friendly staff at reception, in the bar and restaurant and spacious and comfortable rooms. Dinner is normally good and the breakfast and hot chocolate is a great start to the day. Regretably our last stay in October was well below standard, our room was cold, water tepid, towels missing and little done to rectify. We'll put it down to 'just a bad day' and hope they will be back to standard when we stay in March of next year. Parador de Tordesillas is in a Castillian manor house.